Scottish First Minister Nicola Sturgeon has accused the UK Government of sending out a “not welcome here” message to EU nationals. Ms Sturgeon said she wants Scotland to send the opposite message, and she is determined it will remain in the single market even if the rest of the UK leaves. Speaking to investors at the annual Aberdeen Asset Management conference in London, she said: “Scotland voted very strongly to remain in the European Union - by 62% to 38%. Every local authority area in Scotland voted to retain EU membership. She added: “The position of the UK Government and some others is very different. From the refusal to guarantee the status of fellow EU nationals living in Scotland and the UK, to the threat to draw up lists of foreign workers, the UK Government seems intent on sending out a ‘not welcome here’ message. “We want to trade as freely as possible with our EU partners, to continue to welcome people from across the EU and around the world, to maintain ties which have enhanced our prosperity and enriched our society. The Scottish Government has said it will publish proposals aimed at keeping Scotland in the single market in the coming weeks. 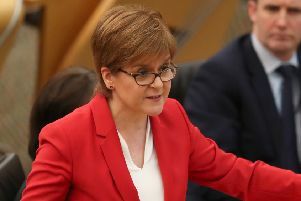 Ms Sturgeon has previously confirmed she is considering a Norway-style model for remaining part of the single market and is looking at the options of the European Free Trade Association and European Economic Area, but the Scottish Conservatives have criticised such moves and questioned Scotland’s ability to join.